IRIScan Pro 3 Cloud is a multi-page document scanner that will let you effortlessly scan piles of papers at lightning speed. Simply feed it with nearly any paper document (up to 50 pages per batch), push on the smart button and it will automatically scan and export your files into the folder or software of your choice (up to 6 export location). IRIScan™ Pro 3 Cloud is also able to scan single and double-sided page in a single pass as well as automatically separate documents of the same batch using blank page separation. It only misses your documents… What are you waiting for? IRIScan Pro 3 Cloud features a “smart button” on its face that allows you to select a destination for your scan by just turning the wheel. Using this button will let you choose between different outputs depending on the documents you want to process. N°1 could be used to export your files as PDF in the “invoice folder” on your desktop and N°2 could be used to import your files in Readiris™. It’s up to you! The “smart button” is fully customizable and lets you configure up 6 different processes.Button Manager is not available for Mac. Thanks to the provided OCR software (Readiris Corporate 14), IRIScan Pro 3 Cloud makes it easy to create searchable and indexed PDF files compatible with virtually any computer. The produced PDF will look exactly the same as the original image while adding a text layer ready to be searched and indexed. It will now be very convenient to find the exact information you are looking for amongst tons of archived documents! IRIScan Pro 3 Cloud makes it very easy to export your scanned documents into your favorite Cloud hosting service. Either you configure the smart button to send your output files in a cloud hosting application installed on your computer (Like Evernote or Dropbox). Or, you can export your files into Readiris to make them searchable and compressed before being uploaded in the cloud (using Readiris' cloud connector). 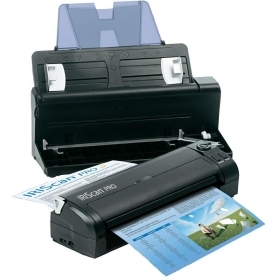 The IRIScan Pro 3 also lets you quickly scan the stack of business cards you have been collecting for so long, or right on the spot when you meet a business partner at a trade show or in a meeting. You can then automatically extract all their data with the provided business cards recognition software Cardiris™, and export your digital contacts to Outlook, Excel, Salesforce, ACT!, and more.